Cancer treatment: Is American patent law hindering the discovery of more cancer vaccines? Why Aren’t There More Cancer Vaccines? Blame America’s lousy patent system. 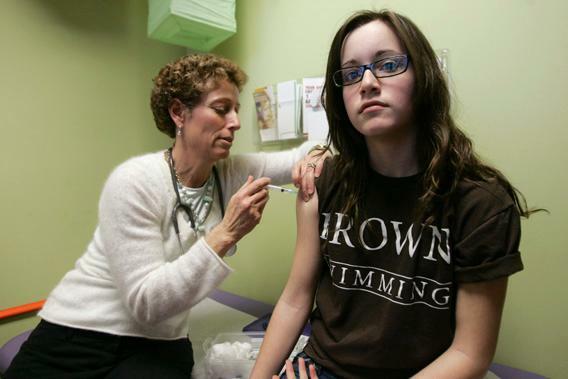 In this file photo, a teenage patient receives the HPV vaccine. A revision of U.S. patent policy could encourage research of more cancer vaccines. Six years from now, when my daughter turns 11, she will get a three-part human papillomavirus vaccine that will reduce her chances of getting cervical cancer by around 70 percent. Currently a little over half of American girls get the HPV vaccine, a public health intervention that will prevent tens of thousands of cancers. It’s one of modern medicine’s few success stories in finding a means of preventing cancer. Maybe the reason we have so few cancer vaccines is that they’re harder to develop than treatments for patients who already have cancer, which are more common. But in an as yet unpublished study, economists Eric Budish and Heidi Williams teamed up with patent lawyer Ben Roin to argue that the scarcity of preventive measures and relative abundance of late stage cancer treatments can also be blamed on the distorting effects that the U.S. patent system has on medical research. The duration of patent protection in the U.S. is 20 years. All drug innovations get patented at the time of discovery, but late-stage cancer treatments will work their way through the clinical trials required for FDA approval much more quickly, since the effect on patient survival will be apparent within a couple of years. That means fewer years of the patent clock ticking without revenues coming in. For a preventive treatment like the HPV vaccine, the 20 years of patent protection will be long expired before any clinical trial can show whether lives are being saved, which in turn makes vaccines far less alluring investments for biotech companies. It’s yet another indication of America’s patent system’s desperate need for a makeover. To appreciate what’s wrong with the American system of granting fixed-length, 20-year patents, you first need to understand why we grant patents—and make them expire—in the first place. A patent gives an inventor ownership over her intellectual property, in much the same way a homeowner holds title to her house. This affords the inventor a period of exclusive rights to profit financially from the fruits of her innovation. Without this protection, who would go through the time and trouble of inventing anything in the first place, when someone could just take the idea and run with it? At the same time, this license to exploit an idea for private gain needs to be balanced against the social benefits that come with universal access to new knowledge. After a patent expires, other innovators can build on earlier breakthroughs and competitors can market similar products without worrying about licensing contracts, patent litigation, or other headaches. The need to encourage invention and to let ideas be free leads to the compromise of giving patent protection for a limited period of time. Thanks to patent protection, we have biotech companies that spend billions developing next-generation drugs, and thanks to patents’ limited lifespans, we have generic manufacturers waiting to rush in with lower prices as soon as the patent ends. The authors’ argument for how fixed patent terms distort R&D is simple. In most cases, inventors need to file for patents early on in the process, before they even enter trials, lest word get out and competitors beat them to the patent office. Consider a drug that takes two years to bring to market. Given our 20-year patent term, the drug’s manufacturer would get 18 years of patent protection after the drug goes on sale. Now consider a drug that takes 18 years to bring to market. Its manufacturer would get only two years of protection once it hits the market. For drugs that take more than 20 years to develop, there won’t be any post R&D patent protection at all. The heart of the new study shows how these incentives have affected biomedical research in America over the past few decades, with a focus on cancer. Why cancer? Obviously, given the suffering caused by the disease, we care a lot about anything that might be holding back the development of better treatments. And if you’re interested in the connection between time to commercialization and biotech investments, cancer affords an additional set of advantages. The lag between invention and going to market is dictated primarily by the length of trials required for Food and Drug Administration approval, and trial length, in turn, is determined by patients’ survival rates. Generally, to get approval for a new cancer drug you need to show that patients live longer. It doesn’t take long to determine whether a new treatment adds months of life in the case of metastatic cancers (those that have spread throughout the body): 90 percent of patients with such cancers are dead in less than five years. But it can take more than a decade to see whether survival is affected for localized cancers that remain confined to a single organ. And for treatments aimed at cancer prevention—the holy grail of cancer research—it could take multiple decades to prove a treatment’s efficacy. Using records from the National Cancer Institute, the authors link data on survival rates by cancer type (e.g., prostate) and stage (i.e., local versus regional versus metastasized) to clinical trial data on treatments targeted at a particular stage-type (e.g., metastatic prostate). They find that there are many more trials for deadlier cancers, a pattern that persists after they account for other considerations such as the frequency with which a cancer occurs or the type of individual (gender and age) most likely affected by it. Their calculations indicate that a 10 percentage point increase in the five-year survival rate of a given cancer type leads to an 8.7 percent decrease in R&D investment, an enormous effect when you consider the fact that metastatic cancers have an average five-year survival rate of 10 percent, versus 70 percent for localized cancers. It’s not exactly wrong to devote resources to improving the prospects of metastatic cancer patients—theirs is the deadliest type. But as the saying goes, an ounce of prevention is worth a pound of cure: We’d be saving more years of life if we had more research on early-stage treatment and vaccines that prevented people from facing metastatic cancers to begin with. The authors provide some rough (and highly speculative) calculations for how many lives might have been saved with a better-designed patent system, and come up with a figure of 890,000 life-years saved for patients diagnosed in 2003 alone. There are exceptions to the rule that late-stage cancers attract more research resources, but many of these exceptions only serve to reinforce the study’s findings. For example, there are a lot of clinical trials for treatment of breast cancers of every stage. Call it the Betty Ford–Susan Komen effect—the breast cancer awareness movement has been enormously effective at raising money for research. But within breast cancer types, the general pattern of more trials for metastatic than localized cancers still holds. Given the study’s findings, you wouldn’t expect any cancer prevention drugs to have been developed. In fact, there are six such FDA-approved treatments. But these were either developed with public money, meaning profits weren’t a consideration, or gained FDA approval using so-called “surrogate endpoint” trials, where a treatment’s effectiveness is determined by a biological marker other than death. That turns out to have been the case for the HPV vaccine. Gardasil, developed by Merck, was approved on the basis of the presence of “atypical cervical cells” rather than patient survival, so the trial lasted only around four years. In fact, for leukemia and other cancers of the blood, where a treatment’s efficacy can be shown based on the surrogate endpoint of white blood cell counts, the negative relationship between cancer survival rate and number of trials disappears, as one might expect given that survival time doesn’t affect trial length. Removing this distortion to research incentives would seem to be straightforward: Allow biotech companies to apply for patents at the time of invention, but only start the patent clock ticking after clinical trials are completed. But even if the authors’ theory is well-reasoned, legislative practice is quite another matter. Kevin Sharer, CEO of biotech giant Amgen from 2000 to 2012, sums up the prospects of any major patent reform as a “150 foot putt”—in other words, impossible. Many competing factions would surely see any attempt to change patent law as an opportunity to twist the rules in their favor, making intellectual property reform another casualty of Capitol Hill gridlock. The authors of the new study argue that the law should go even further and actually give long-trial drugs more protection than short-trial drugs following approval, instead of less (and also potentially cut back protection for short-trial drugs). Their argument has two parts: First, drugs with short trial times also tend to have lower development costs, so they’d get done even without the extra protection. Second, since drugs with long trial times tend to focus on prevention or early-stage treatment, they may have higher societal payoffs than drugs that spend just a few years in development. Yet such legal innovation would surely have unanticipated consequences: For every well-meaning rule change, creative legal teams would develop new and unexpected ways of gaming the system. It’s for this reason that ex-Amgen CEO Sharer says that the rule-makers had better “shine a laser beam” on the particular disease classes where they hope to encourage innovations. Sharer points to the Orphan Drug Act of 1983, which gave seven years of market exclusivity, along with tax incentives, for drugs that treat rare diseases that would go uninvestigated without greater incentives. It’s likely that many industries besides biotech suffer from the same distortionary effects of the 20-year patent rule—biotech is hardly unique in the long lag between discovery and commercialization. And other areas of research may not have the workaround of extending protection through regulators like the FDA. So if you consider the implications of this new study more broadly, it’s yet another argument that American legislators need to find the political will for a long-overdue overhaul of the patent system, and a responsibility to do it in such a way that logic and reason do defeat the lobbying assault that would accompany it. American business isn’t exactly renowned for forward thinking, with executives rarely looking beyond the next quarter’s earnings. The last thing they need is an ill-designed patent system to further encourage their short-sightedness.